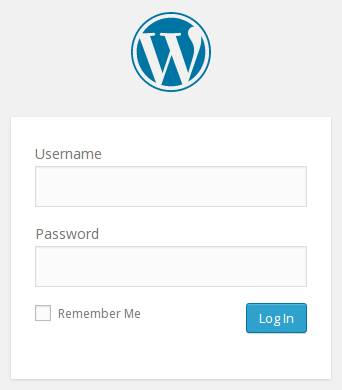 In this blog-post we will look at setting up WordPress on our LAMP-server running on Ubuntu Server 14.04 LTS. …However, I’m perfectly fine with using only the original utf8 (utf8mb3) as default, since I do not need more than the first 65,536 codepoints (which uses 1 to 3 bytes per character). I’m not planning to blog in full Cantonese any time soon 🙂 If you are in need for full coverage of CJVK (Chinese, Japanese, Vietnam, Korean) you should go with utf8mb4 that uses 1 to 4 bytes per character. You can read more about MySQL and uft8mb4 here. drwxr-xr-x  3 root root 4096 Jun 22 19:42 .
drwxr-xr-x 94 root root 4096 Jun 23 16:14 .. 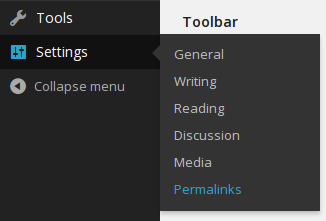 Create a user that we later will use with wordpress to connect to this database, again I’m giving it a suitable name for clarity. Password_here should of course be substituted with your chosen password. 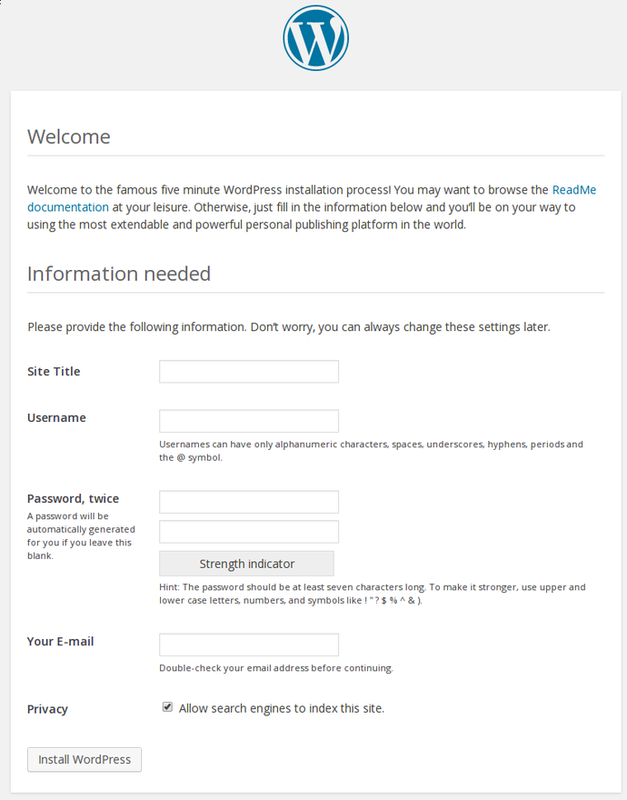 Unpack, This will create a directory called wordpress in your download directory. The last entry makes sure only five revisions of posts are kept in the database. The default is 30 but I do not want that many in order to keep the db small and tidy. Put in whatever value you want here. 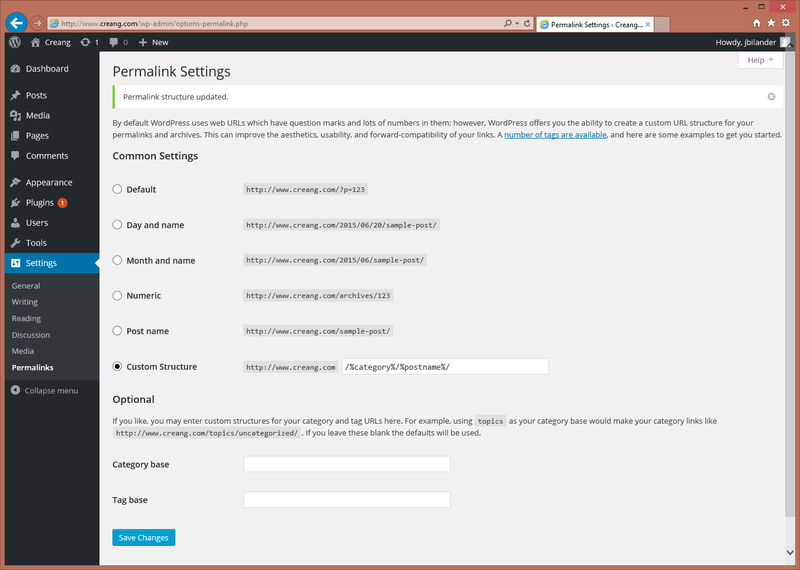 Create an uploads-folder under the wp-content folder. Change the owner of the files recursively to your user and group. I’m using nobody and www-data here. 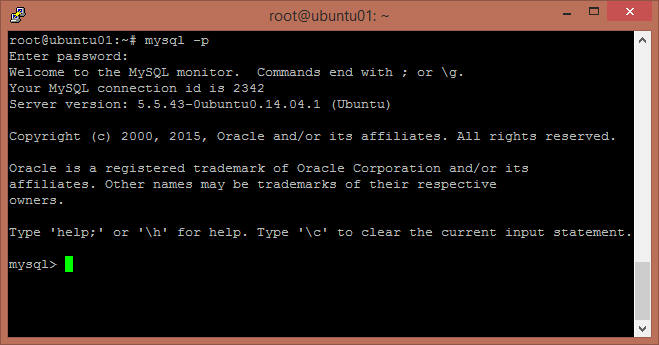 Ok, so we have apache 2.4. We will set this site up as one of several name-based web sites on a single IP-address. For the 2.4-version of Apache the examples for this can be found here. Now, comment out the Directory /var/www, we don’t need that directory enabled any longer. The a2dissite-command does the removal of the symlink in folder sites-enabled. We double check that the job is done. drwxr-xr-x 2 root root 4096 Jun 20 17:11 .
drwxr-xr-x 8 root root 4096 Jun 20 16:51 ..
Now, having both the .com and the .se domain with the same name I want them all to point to the same site redirecting to www.creang.com regardless if you type creang.com, creang.se or www.creang.se in your browser they will all redirect to www.creang.com. This will require a little DNS-configuration and some Apache-config as well. In DNS, I set up both www-subdomains as CNAME-records pointing to the naked domain name. Like this. Two A-records are set up to point to the public IP-address of the server. They will be updated automatically via ddclient should my ip-address change, read more about how to configure that here. The first VirtualHost section takes care of the redirect. Since this is a permanent redirect I went with 301, good for SEO-purposes. The second section points out the document root and sets some permissions where AllowOverride All is important for enabling the use of .htaccess-files, which we will use from WordPress in order to enable mod_rewrite and the use of clean urls. drwxr-xr-x 2 root root 4096 Jun 20 20:11 .
drwxr-xr-x 8 root root 4096 Jun 29 16:29 ..
Now we need to restart our apache server in order for the new wordpress site to come alive. Be aware that if you have configured your machine with a public IP-address then maybe you should set a temporary firewall rule in place first, so that only you (your ip-address) are allowed to access the server during setup of wordpress. 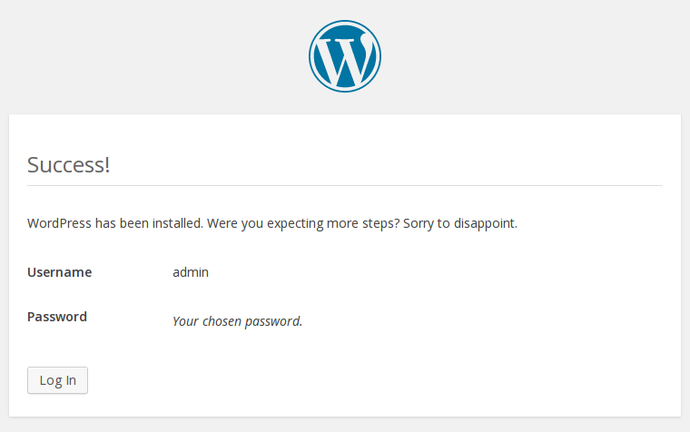 Not so fun if anyone hijacks your wordpress installation. Maybe something similar to below in order to allow only clients from a specific IP-range…and don’t forget to temporary remove the any-client-accept-rule and verify that the new rule takes full effect before continuing. Delete this rule later when you go live. Point your browser to your url. You should now see the welcome screen. Indeed utf8mb4 is used here. That’s all for now. In the next blog-post we will look at setting up the WordPress-plugin Akismet to protect comments and contact forms from spam. Edit! Now available here.